of your choice, in our exclusive range of colours. 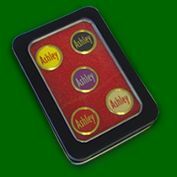 We can fit up to 35 characters on each marker - you can leave the layout of the name or wording up to us. 10% DISCOUNT on all orders over £75 will apply at the shopping cart. with a header card as illustrated. For each pack you require, add to cart and then repeat with your next required pack. drawstring pouch. The pouch is approximately 50mm wide by 60mm tall. For each pouch you require, add to cart and then repeat with your next required pouch. on 3 lines etc. You can leave the layout of the wording to us.